January 2011 – "da Trooper Bali"
Selamat pagi dan selamat beraktifitas. Selamat Tahu Baru juga kami ucapkan kepada semua sahabat dan teman yang setia mengunjungi website “da Trooper Bali” ini. Saya ingin berbagi cerita mengenai perjalanan kami ke Dataran tinggi Dieng, di Kabupaten Wonosobo, Jawa Tengah. Perjalanan ini saya ke Dieng untuk menghadiri Trooper Indonesi Gathering X yang akan dihadiri oleh kurang lebih 120 kendaraan, utamanya tentu Trooper karena acara ini adalah hajatan tahunan Komunitas Trooper Indonesia yang ke X. Acara ini diadakan sekali dalam setahun dan biasanya diadakan pada akhir tahun. Pun kami di Bali, warga “da Trooper Bali” sebagai anggota dari Komunitas Trooper Indonesia berencana untuk hadir juga. Pada awal wacana rencananya kami akan datang membawa 8 kendaraan, namun setelah beberapa kali pertemuan akhirnya yang positive berangkat hanya 4 mobil. Itupun tidak berangkat bersamaan. Ikutilah cerita selengkapnya dibawah ini. Sebagai bahan pertimbangan buat yang ada rencana untuk berlibur ke tempat wisata dunia. Gumug Pasir Parangkusumo terletak di Yogyakarta. Gumuk pasir merupakan gundukan-gundukan yang berisi material pasir di sepanjang Pantai Parangtritis- Parangkusumo sampai muara Sungai Opak. Hal ini merupakan fenomenal unik karena hanya satu-satunya di Asia Tenggara kita bisa melihat padang pasir seperti padang pasir sahara. Walaupun gundukan pasir ini tidak seluas Sahara tapi membuat seolah-olah kita berada di Gurun Sahara. Kadang-kadang Gumug Pasir Parangkusumo ini disebut juga sebagai Sahara in Java. Way Kambas Sumatera memiliki satwa yang mirip dengan satwa yang ada di hutan India seperti gajah, harimau, Badak dan beberapa hewan lain. Taman Nasional Way Kambas (TNWK) terletak di propinsi Lampung. Way Kambas terdiri dari hutan rawa air tawar, padang alang-alang/ semak belukar, dan hutan pantai di Sumatera. Di Way Kambas ada wisata naik gajah sehingga kita bisa merasakan sensasi seperti raja-raja India yang konon bepergian dengan menunggang gajah.Masih banyak tempat wisata di Indonesia yang tidak dituliskan disini. Bangsa Indonesia patut bangga dengan kekayaan alam yang ada di Indonesia. Semua tersedia di Indonesia. Yes there is a house with built like a big heard bird. It is a giant bird which is trying to out from the big box. The idea is quiet creative. “Do we need to take a picture for it..? “ I asked the convoy. Okay no need to stop. Just keep it rolling. But in slowdown. We can take a picture of it without stop.” Some one responding to me. “Alright than.” I said. “Okay then Pak Dede, we keep rolling but please slowdown.” I order to Pak Dede who is in the front line as a leader. “Pak Dewa and our friends from Brunei. Do you copy me…? Please tell me your position right now.” Pak Adi from Mentari Restaurant calling over the radio. “Yes Pak Adi. I copy you. Currently we already passing Batunya village.” I said. “Thank you Pak Adi.” Sorry for being late.” As you knew we facing a fog all over the way to Kintamani.” I said. “No problem at all Pak.” He replied again. The day get starting to dark and in addition the cloud also make the light of the sun could not reach the earth. We start feeling cold as we are now already about 1.475 meters above the sea it is about 18 degree Celcius which is quiet cold for us. I see the digital clock in the console box of my Black Trooper. It is already 6.15 pm and we still moving to following the small road and will be end to the main road of Denpasar to Singaraja. “Please turn right on the front of “T” junction. We will entering Mentari Restaurant in the next 5 minutes.” I explain to all of the participants. We following the main road slowly as the decline road to the lake side of the Beratan Lake. And in about 5 minutes we finally entering Mentari Restauant. Pak Adi the staff of Mentari Restaurant welcoming us. We shake hands together and host the participant to have a coffee break. The menu of coffee break are Coffee or tea, young sweet corn with steam, Balinese black pourage with sweet coconut milk, fried banana and season fruit like watermelon, papaya, honey melon. Since the whether quiet cold now, the coffee break really taste delicious after the long journey from Plaga village under the light rain. All of the participants enjoyed the coffee break. We enjoy the coffee break while we chit chat about the road and the moment that we passing during the trip. After the light coffee break, we will continue the trip back to Palm Beach Hotel Kuta, and probably will arrive in the hotel about 9.30 pm. “Dewa where is the nearest gasoline station in here…? “ Babe Harry Sanusi ask me suddenly. “Oh ya. The nearest is in a head about 500 meters from here.” “But there is also another gasoline station along the way to Denpasar. We will find, one, two, three station the nearest about 1 or 2 kilometers from here in the south where we will passing them by.” I explain to Babe Harry more detail. “Alright then.” Let me check with the participant vehicle. So they can prepare and will filling their tank in full. There is four vehicle that need to refilling their tank.” He said. At 7.45 pm Bali time, finally we move from Mentari Restaurant to Palm Beach Hotel in Kuta after we say thank you and good bye to Pak Adi the staff of Mentari Restaurant. The light rain starting again when we start moving. I start the engine and starting to move when I see Pak Wiranto open his engine hood, so I stop and jump out of the da Trooper to know what happen with the engine of the short Yellow Trooper of Pak Wranto, while the engine fell more hard now. “What happen Pak .” I asked . “Not really problem Oak, but there is one “skunt” cable connection for the Starter dynamo are broken.” He explain. “How hard it is Pak . May I see.” I asked and take the “skunt”. Yes the skunt aer broken and it is difficult to fit the “skunt” to the terminal power of the dynamo starter. It is cause there is no power electricity to the dynamo and it mean we could not start the engine. “Pak Wiranto may we have to open the clip of the “skunt” and clip the cable on it for emergency. I think we could do it just for this night. But tomorrow please visit your technician and ask to change the “skunt” immediately.” I said. “Yes. I will Pak Dewa.” He said. “We than work together to open the clip of the “skunt” and clip the inner of the cable in it carfully and press the clip to hold tight the inner of the cable. After we fit the “skunt” to the terminal connection of the dynamo starter, I ask Pak Wiranto to start the engine. And yes. It is work. The rain even more hard right now. And all of us soon jump onto the da Trooper. We start slowly to the south. “Pak Dede monitor….” I call Pak Dede the convoy leader to knowing their last position since they move about 15 minutes in advance from us. “Go a head….” He replied. “Where is your position now over…”? I asked again. We are already been in the gasoline station. It is the second station from Mentari Restaurant as the first stations is has no stock for diesel.” He explain once again. “It is about 6 km from Mentari Restaurant.” He explain once again. ”How is Pak Wiranto da Trooper…? It is Okay..?” he asked again. “Oh yeach. It is okay. But tomorrow he must change the “skunt” to avoid the same problem in the future. “ I explain. “Alright then… So we can move directly to Kuta after all of the vehicle are refilling their own tank.” I said. The rain fall more hard now. I jump onto the da Trooper and lying on the head rest bucket to refresh my self. The time shown 7.45 pm Bali time. Quiet late too. It is need about 1 to 2 hours to reach Palm Beach in Kuta if we moving in the rain like now. Almost on 8 pm Bali time we start moving to Palm Beach in Kuta. We just following the regular road, pasing Luwus Village, Perean Vilage, Mekarsari village, Mengwi, Kapal and we turn right in Abianbase village will bring us to the short cut of Kuta, passing by Krobokan, Seminyak, North Legian and we will out in the “T” junction in North Legian to the left since it is forbidden to go straight in those “T” junction so we turn left and then to Jalan Legian and finally we entering the Jalan Wana Segara and entering the Palm Beach otel to take a rest for another day activity tomorrow. OK my friends that’s all of our story for the journey hosting our friends from Brunei Darussalam tour de Bali. Please stay tune with us coz we will came again with another good story for all of you. Please visit this site everytime….. COz we will always write you an interesting story. “Pak Dewa, where we have to park our cars. ?” He asked me again. “Please lead us to the Lake View Restaurant parking area.” I replied to Pak Dede. “But I pass the Lake View Restaurant.” He said. “Okay. You just back ward by slowly and turn to the right.” I asked to Pak Dede once again. Please read the full story now. Everyone please turn to the right We already arrive in lake View Restaurant.” Please be careful as our vision very limited.” I remind all the participant. “Pak Dede, please watch us and give a sign to the people that we will turn to the right.” I asked Pak Dede to help us to give the sign to other people that we will crossing the road to Lake View Restaurant. “Are everyone has crossing the road and entering the parking lot of restaurant…?” I asked to the member. “Okay. All the vehicle are in the parking lot now.” One members responding. The rain still fall but not so hard rain. I jump out from my da Trooper and walk closely to the Toyota Hi Lux Tiger, where is Babe Harry also jump out from it. We shake hand together and walk in rain to other vehicle and say hello to Mr. Haji Ibrahim Nawi Awang Damit and host the participant to entering the main dining room.of restaurant. Some ladies came to us offering the rings, the necklace, the T-shirts and other items that they sell. I watching them offering their items to the participant.and talk to them and get inform that they only sell in consignment. They will get the fee based on the total items that they sold in the daily basis. The Lake View Restaurant built in the Hill top where we can see around to the mountain and the vegetable plantation like a cabbage, carrots, potatoes, chili, celery, onion and another vegetable plant. And the back ground of the panorama is the rock and black sand with the Batur volcano mountain. But unfortunately, we could not see those beautiful panorama clearly as the hard fog has closed our vision. Lake View Restaurant main dining room is quiet big. It has about 200 seat and can be maximize up to 300 seat if needed. It’s also has another wing dining room which is located in the side of hill terrace. The seat capacity about 150 to 200 seats with a very beautiful panorama down there. Pak Wiranto our friend from KTI Bali already been there with his family, the wife and his two boy welcoming us and host us to the table set and a companying us also to get the foods from the food displaying desk. “You may start from the soup, salad or direct to the main dishes.” He offer us the meals. “Thank you Pak.” I said and check the participant to start the lunch. It is quiet late lunch actually as we just arrived to the restaurant at 13.47 Bali time. As I am hungry too, I than join the participant to had a lunch and take a seat in front of Pak Rudy the staff of Babe Harry, while our friend Pak Nyoman, his wife Ibu Dian and his child, Pak Made and Pak Dede also join us to had a lunch. The foods is good and has many variety. The vegetable soup, chicken soup, Salad with mixed vegetable, fried chicken, fried rice, white rice, chicken satay with peanuts sauces, tuna and prawn grilled and smoked beef, Hot snack like spring roll, chicken wings, friend banana, and a season fruit like water melon, papaya, melon and pineapple for the dessert. We also have a coffee or tea for the closing. The taste is also delicious. In addition due to the rain and a cold whether, we feel hungry and had a meals much more than regularly. The participants are seem enjoy the foods very much, especially for the children, they like the fruit and the fried banana with the fla sauces. It is nice and have a great taste as I feel too. After having a lunch we still spent the times for a few minutes to chit chat and talking about the trip that we will continue today. Upon all of the participant get ready, we go to the parking lot and take a picture together for our documentation. Although the rain still falling to the ground, but all of us are enthusiast to take a picture of us. We change the camera to take the pictures. By 14.42 Bali time, we move to the north Kintamani to continue our trip to Plaga to see the highest bridge in Petang, Plaga North of Badung regency. The fog still hard and close our vision. Every things seem are white. We moving forward slowly. We turn left and follow the road to North Kintamani, Sukawana. We follow the main road to the north. Actually the panorama is very beautiful around there, but since the hard fog covering the area, we could not see the panorama we only could see a part and the close view not a full panorama. We move to the north in slowly. For safety driving, we turn on the light of the vehicle, and since we move in convoy the people are watching us in wondering. After a few minutes, we out of the village and start entering the forest in both side of the road, and in a few part we passing the valley with about 10 or more meters deep down from the road. The road now have a “U” and “S” turn and the inclination about 15 to 35 degree beside a hard fog. This condition make us must be careful and concentrate to the road for the safety reason. “Dewa how long we will take to the bridge. ?” Babe Harry asked. “It is about one and half an hours Be.” I replied. “Okay. Copy that.” He replied. We are now passing the field of the orange. Yes the orange field. Where is some plant with it’s young fruit. We moving in the incline “S” turn and. There is a rice field in both side of the road and again a forest. After almost an hour, the road is getting down and now we are in 1.450 meters above of the sea and will going down again until 1.100 meters in the bridge. In a few minutes we entering the Plaga village. And the road now still getting down with a eucalyptus trees in both side of the road. “Attention to the convoy, in our right side is the Boxing Camp of Daniel Bahari. In this camp Chris John the champion of WBF Welter Class has his work out and exercise and spring partner before he depends his title for a few months.” I explain to the participants. “Okay. Copy that.” One responding from the convoy..
We moving forward in slowly while we see around. “Hi look at that. “The bridge…!!! ?” Shout one of the participant over the radio. “Yes the bridge…” We could see it from our windows. The bridge is still about 2 kilometers from our position in the highest position right now. The bridge seem so long combine the Plaga village and Kintamani village. We still moving and soon we getting closed to the bridge. And after the “S”: turn we finally arrive in the bridge and we cross the road and park in the right side of the bridge to take picture. In here the rain just stop. But there is still no sun. The whether feel quiet cold. We jump out from the vehicle and sight seeing around the bridge. The high of the bridge is about 787 meters from the based of Tukad Bangkung. This high made the bridge is the highest in Indonesia and perhaps in Asia. We come together and take a picture in the side of the valley with the back ground of the bridge. We discuss about the bridge and every things which related to the bridge, how long it takes to built the bridge,. We take a picture in a few position. After have sight seeing around those highest bridge we continue our trip to Candikuning, Bedugul. We will have a coffee break in Mentari Resataurant. We are now in Plaga village. Plaga village is located in the north side of Badung regency with about 1,470 meters high above the sea. Plaga actually very closed with Candikuning, Bedugul but they bordering by Batukaru mountain. Therefore the season quiet the same with Bedugul. And the rain fall quiet often in the area hence make the land is good for any kind of plantation which is need a soft and humi land. Furthermore the high land make the season quiet cold. It is almost cold like in Lembang, Puncak Pass in West Java . We are now passing the “T”: junction which is the way to Pura Pucak Mangu to the right and to Denpasar or Tabanan to the straight. “We go to to straight to Denpasar – Tabanan ways.” Pak Dede our leader inform us about the way. “Okay. Copy that.” One respond from the participant. We straight on the “T” junction and now we entering the small wide road and still down the hill. In the left and right side of the road is a field which a tomato and chili plantation and also there is a dragon fruit which still in a flowers. In some part there is also a murbay plant which according to my relatives is plant to develop the silk material. The road has so many “S” and “U” turn and up to down due to we following the hill to go to Bedugul. “All of the participant please be careful we will facing a “T” junction with an inclined “. I remind to the convoy. “Please take to straight to Batunya – Bedugul ways. Please be careful the road is a small wide.” I remind them again. “Copy that.” Some one reply over the radio. The road is small as we take short ways and we cut quiet lot the length of the duration if we go to the regular ways. By passing this route we may cut for about 2 hour more faster, but in consequent of it we have to facing the small road with some obstacle that we may facing in this way. But according to our experience in some trip by passing this way, it is not so heavy obstacle. We do not need to activating the 4 wheel drive. But we need to manage our legs and handy the steering wheel very well. We facing the Balinese main gate with wording “Selamat Datang di Desa Catur”. Mean “Welcome to Catur village”. The road is inclined about 20 degree and after a few meters entering the road, the road will divided to left and right side. The left side is declining while to the right side is inclining. “Attention to all the participant.” In front of us the road will divided to the left side and the right side.” We will follow the right side road. The inclining one.” I inform to the convoy over the radio. “Okay. Copy that.” Said of the participant replying my order. We start to climbing the road and the participant quite wondering to see such a beautiful panorama surround the land. It is very beautiful and magnificent panorama surround it. It is still pure nature. My mobile phone vibrate and ringing. I take it from its case and press answer. It is from Pak Adi the staff of Pak Agus Pendit from Mentari Restaurant . He asking our position and the frequency of our radio communication where we work, I inform him that we work in 146.750 Mhz. This is the KTI Jakarta frequency that they used for every of their convoy activity in Jakarta. Within a few minutes he calling for us over the radio. Still quiet low and bad in receive. He transmit form the vehicle in Mentari Restaurant. The Trooper Pick Up green color. We are now entering Batunya village. This is also an agro culture village. The population of this village about 2,760 peoples. Nad most all of them are a vegetable farmer. In their land thy plating the tomato, chili, cabbage, salad, carrot, potatoes, onion, broccoli, green bean string and many other vegetable plantation. We passing their field, when suddenly one participant shouting on the radio. “Hey look at that house. It is in our right side. There is a house with a head bird.” He said. Yes there is a house with built like a big head bird. It is a giant bird which is trying to out from the big box. The idea is quiet creative. Don’t forget to read the next story. “This is Sukawati art market where we can find a souvenir or a handicraft for your relatives or neighbour.” I explain to the participant over the radio. “OK. Copy that.” One participant comment over the radio too. We move very slowly due to the busy traffic and many vehicle passing by. Sukawati Art Market already been busy since 5.30 am in the morning as the artist people from the major village of the Gianyar residence bring and off their creation to the art shop in the Sukawati Market. Most of them just put their creation as a consignment goods in the art shop that they trust and the art shop will pay them upon their creation are sold. So the artist always have to wait the money from their produce almost a month or more to cashing their product. It is very poor to get money from their creation. We still move very slowly from the traffic, while we keep in contact over the radio to inform the participants about the art market and the things that may interest for the tourist. We offer to the participant to stop over just to have a look about the handicraft and other goods for souvenir, but they do not wants to, as most of the children are hungry heavily. So we continue our trip out from the busy market very slowly. Almost 20 minutes we trap on those busy road after finally we out from it and follows the road to Payangan to make the destination shortly cut. “Pak Dewa which way we will go thru…?” I heard Pak Dede who lead us to Kintamani asking me over the radio. “Oh yeach. I think we will go thru Payangan, Goa Gajah, Bedulu, Tampaksiring and Kintamani. How do you think.” I asked back to Pak Dede for his opinion. “Ach ya. It would be okey. We can reach Lake View Restaurant in short time.”: He replied. “Bedu” or ” Beda” mean different. “Hulu” mean the top or “head”. So Bedulu meaning the different between the top. This is the story of the King of Bedulu in long time a go. The King of Bedulu is very strong and smart. He have a supra natural power which realize what he wants. One night the King wants to go around the kingdom but the only his head is go while his body still left on his bedroom. Before he left his body, he give a message to his wife that she must wake up his body if until the morning is broken he still not get up from the bed otherwise he will die. After messaging to his wife the King head left his body and go around the Kingdom to watching his peoples closely. Since he go around the kingdom quiet far from his palace and furthermore the King forget and not realized that the morning has broken. He still go around to watching the peoples who still not sleep and discussing with their child how to get the foods for tomorrow. . While his wife who watching and waiting his body realized that the morning has broken and she is afraid, very afraid that the King will die if she is not wake up him soon. She than wake up the King but got confuse when she realized the King has no head. She run out of the room in confuse. When she saw the people who is processing the pig for the religion ceremony, she pick up that pig head and run back to the King bedroom and put the pig head on the King neck body and in amazing the pig head suddenly get growth and built in the King neck body and he get up from the bed and slowly find his wife and say thank for wake up him in time. But the king wife is trembling as the King now become incredible, the body is human but his head is a pig. She is very afraid that the King will angry as she change his head with a pig head. But the King seem like knew what she is keeping in her mind. And suddenly the King said : “Don’t worry my wife. This is not your fault. My destiny is like this. My head will be change like this.” It is came in my dream many times.” He continued. “Oh my majesty, I am so sorry This happen to you.” Please forgive me your majesty. I am so stupid.” She start crying and fall down her self in front of the foot of the King of Bedulu. “Oh no my wife. This is not your fault.” “This is my destiny.” Please wake up and prepare our day.” The King continued his order. The King than out from the room following with his wife and of course the peoples who see the King than shouted. The King “Beda Ulu.” Mean; Oh god, The head of the King is different.” That’s way the kindom than named Bedulu as like what we known as Bedulu now and then. Ok my friends, I will tell this story in detail in the next occasion. Let’s back to our journey to Kintamani. We still move following the main road to Tampaksiring. Before we will reach Kintamani. A long the way only a coconut and some local plantation like a banana, a manggosteen, a guava, and some local orange. The main road not so wide and the rain would make a road quiet slippery and in addition the fog make our vision to the front very limited. Therefore we must watch and take care the way to avoid an accident may occur in those condition. We keep contact to each others especially after the cross line or the T junction, to keep all the participant of convoy in line and no one will left or misdirection. “We will entering the Tampaksiring village approximately in 200 meters” I inform to the participant over the radio. “All the convoy, we are now entering the Tampaksiring village.” Babe Harry than continue to inform the participant. “In Tampaksiring there is a President palace, which is built by President Soekarno in the year of 1956.” Babe Harry continue. “But we will not stop over in there as if we wants to visit the Palace we have to apply a month in advance in written.” I explain to the participant over the radio. “In our left side is the corridor of the palace which is can see the view of the river and the rice field in the background before the hill.” I explain once again. “Okay. Copy that.” One participant responded..
“We will turn to the right direction and down to the bridge to quiet incline.” I explain once again while I drive and turn to the left down to the bridge which will follows the way to Kintamani. The rain still fall although not so hard which is make the atmosphere feel nice cold, but the fog fall and close our vision and every things in front of us are white. Suddenly my mobile phone ringing. I take it from it’s case, open the flip and hear the voice out there. It is from Pak Wiranto our friend from KTI Bali. He inform me that he is already been in Lake View Restaurant and also inform that the fog is very hard. We could not see the panorama down there. All is white because of the fog covering all of the space. I just inform him that we already been in Tampaksiring village and probably will reach Kintamani in a half an hour. I asked Pak Wiranto to prepare the parking area and check the seat that we reserve for 35 pax. We are still moving following to the main road to Kintamani Hill. The road has so many turn and inclining. While the rain still falling but now not so hard like before. I see the altimeter in the dashboard which is now displaying to above 950 meter above of the sea, and for sure we climb to the hill and getting highest time to time. Kintamani its elf is about 1,600 meters above of the sea. But the mount Batur is located down of the Penelokan valey which is about 900 meters above of the sea. If we wants to down to the foot of the mountain we have to follows the road which is down to the Penelokan, passing the Kedisan village. The road is quiet good as it is nice asphalt road, between the rock hill in the left and right side of the road. The rock is combine of stone and the lava which is stoned after out from the caldera of the Batur mountain. The road will end in the side of the lake Batur which is quiet busy by the domestic and overseas tourists. The road also bring to the domestic harbor of the lake Batur. There is a small ancient village named. Trunyan which is located a cross of the lake Batur. Trunyan has a unique tradition for their die peoples. Not like other villages which buried or cremated their bodies, in Trunyan the bodies just put it standing in the yard under big old “Pole” tree standing. They not buried or cremated the bodies. It is amazing, ‘cause the bodies will dry and not raising a bad smell. According to the literature, this tradition is a real Bali tradition, which is a call the Baliaga. But we would not crossing the lake to visit Trunyan, we only will had a buffet lunch in Lake View Restaurant, since we have a limited time and must catch up the time to visit the highest bridge which is combine the Kintamani and Plaga, Petang, North Badung regency in Tukad Bangkung. We are now approaching the T “junction of Kintamani. To the left side we will reach Kintamani, turn to right will be goes to Klungkung and Bangli residence. “In the front T junction , we turn left.” I said to the participant. “OK copy that.” One members responding. I slow down my Trooper and turn to the left. The road now more wide than before we turn. There is a high grass in the left and right side of the road. The high grass called “Rumput Gajah”. The road still incline and we are climbing the valley higher than higher. Now we are in 1,300 meters above of the sea. “We are now in about 1,300 meters above of the sea.” I inform to the participant over the radio communication. “We will climbing to the Kintamani valley about another 15 kilometers a head.” I inform to the participants over the radio. 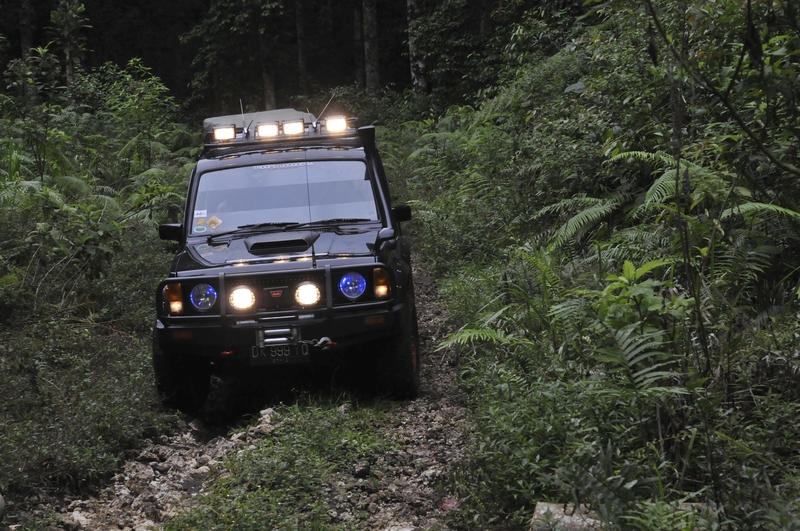 While in front Pak Dede a companying with his daughter with his Dark Grey FJ40 Hard Top and Pak Nyoman, Pak Made and Bu Dian are companying by their two daughter and one boy driving the Soft Grey Metalic Land Cruiser F100 series as a leader still leads us to Kintamani. The fog start covering our vision. We only reach about two meters ahead to see. “Please turn on your fog lamp.” I inform to the participant to driving safety as it is quiet difficult to see ahead and it would be difficult too viewing us by the vehicle which is came from the opposites. “All the convoy please turn on your light and your fog lamp.” Babe Harry heard informing to the participant to turn on their light. To be closed to Kintamani hill the fog much hard and our vision very limited. While the rain start to stop even some time still fall with a soft. “Everyone, please be careful. There is a truck stuck in front on the left side. It is quiet closed to our way.” Pak Dede informing us over the radio. “Okay. Copy that.” One participant respond. “OK in a few meters we will entering Kintamani.” Pak Dede inform us. “Please lead us to the Lake View Restaurant parking area.” Ireplied to Pak Dede. Hello all of my beloved KTI friends….. I am back again to you to share and report our last journey around Bali Island. And this time we have some colleagues and their family from Brunei Darussalam our neighbor country. They will spend their holidays for a few days from 14 to 29 December 2007 in Indonesia and they will spend their times in Bali Island to sight seeing around for three days. Of course they drive their 4 X 4 vehicle such as Toyota Prado, Toyota Land Cruiser, Toyota Hi Lux Tiger and Nissan Patrol TDI. Total vehicle is 12 of 4 X 4 vehicle, while KTI Bali also bring a few friends who driving their Land Cruiser VX and 1 FJ40 Hard Top beside another two Trooper including me and Pak Wiranto with his Yellow short Trooper, but Pak Wiranto and his family go directly to Kintamani and will waiting us in Lake View Restaurant. Alright here we go with the story. Please enjoy…..
Two month ago Babe Harry Sanusi who is famous in an adventure off road and known as one of the IOF (Indonesian Offroader Federation) committee call me to inform that he will have a group from Brunei Darussalam who will trip to Bali and riding their own 4 X 4 vehicle and need may advise about the accommodation with certain budget and also the schedule and the route and the itinerary during in Bali. They plan to touring in Bali is probably in December about 22 to 26 December 2007. According to Babe Harry it would be good if we can bring them to sight seeing to Kintamani and have a lunch in Lake View Restaurant as what we had when we held a Trooper Indonesia Gathering VI Bali in the end of the year 2006. Due to this request, I and a few friend of KTI Bali than discuss about this issue and we start to prepare our self in order to fulfill this request. I by my self start to observe the room rate which is fit for the budget that they have. As we all knew in month of December almost all of the hotel is in high demand for accommodations and to avoid a problem of the accommodations we have to make a book to the hotel in advance and paid for deposit to secure the rooms. After searching to a few hotels that is possible to fit for the budget, finally we assigned the hotel which fit with the budget in Palm Beach Hotel In Jl. Wana Segara,Kuta close with Risata Resort, and ex Holiday Inn..
Again I report to Babe Harry Sanusi about the rate of the rooms and advise him that we have to block the room and must paid for one night deposit to secure the rooms. And Babe Harry is agree with the condition with offer with the Palm Beach Hotel. I also asked Babe Harry to check thru the website of the hotel to compare the room and the rate that they offer in order to find the fit and the best price that we can get. The publish price of the Superior room from this hotel about IDR.650.000,- plus 21% Tax & service will be become of IDR.786.500,- I try to negotiate the price with the hotel but the best price that we can get only with the 25 % off. So we have to find another way to get the better price which is less than IDR.400.000,- I try to bargaining with the hotel, but it is so tough to get it. After long bargaining and long argue and use my empower in my duty and ask one of my friend who have Tours & Travel Agent, finally we could get the best price a little bit below than IDR.400.000,- I than report to Babe Harry about the last condition and he agree to block the room and pay for one deposit of the three night that they will plan. Upon agree by Babe Harry Sanusi about the room rate that we get, he than transfer me the funds for block the room for one night. I by my self then go to the hotel and pay a one night deposit to secure the rooms. So the rooms is secure now. And I start to prepare another things to make every things are OK. I than find the quotation and find the price for the buffet lunch in Lake View Restaurant in Kintamani. Since we have a lunch for our group during Trooper Indonesia Gathering VI in December 2006, this time we can have a best price which is IDR, 45.000,- nett per pax while the publish rate is IDR.60.000,- plus 21% Tax & service become IDR.71.200,- per pax. I soon make a reservation for this group to secure the lunch as well. I make a list to take a note that every thing are well managed in order to make every step and moment are well done. I still have to prepare one thing. The itinerary of the trip and the time schedule of every place that we will visit to control the time that we will spend in every places that we visit. I than make a draft and send it to Babe Harry for his approval and knowledge. While we still have to prepare our self and our vehicle to make sure that we are health and fit and our Trooper is also in the best performance. After every things are in order I feel so confidence and just waiting for the day of the even is coming. After waiting for a few weeks, the time is come. Babe Harry call me that the convoy is move on it’s way to Bali. They start from Brunei on 17 December 2007 to Pontianak and will be cross the sea to Java. But they will shipping their vehicle by container, while the passenger will be fly by air flight to Java. Babe Harry told me to prepare and monitor every things that may needs later on. I agree and convince him about that. 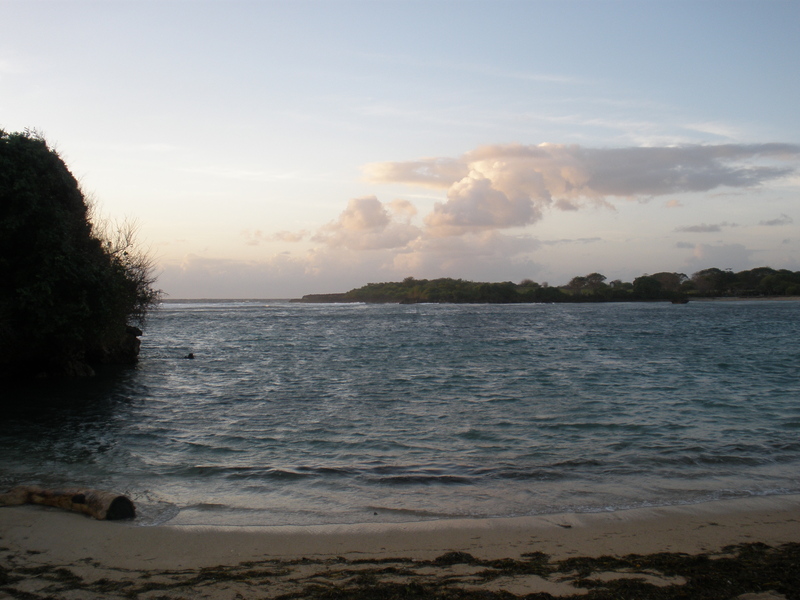 If every things is in order the convoy will be entering Bali Island on 22 December evening about 3 or 5 o’clock pm, so they will have a good time to see the sunset in front of the Hotel beach. I pray for them for their safety and their plan will in order and nothings happen during their way to Bali. On 23 December 2007 Pak Rudy the assistant of Babe Harry call me that due to any problem with one of the vehicle of the participant they must postpone their arrival in Bali for one day. They suppose to be arrives in Bali on 23 December 2007, but due to the problem of one vehicle they must stay for a few hours to fixing the vehicle before they continue their journey. In consequent of those case, I must contact to the hotel and inform about the postpone check in for the next day due to those problem. It is quiet tough to negotiate again with the hotel due to they asking a one night postpone fee. After quiet long argue finally the hotel agree not to charge for one night postpone fee. Thanks God for HIS kindness in this case. On 22 December 2007morning I call Babe Harry to his celuller asking where are they are now and get inform that they just arrive in Bromo and will stay for one night to see the Sunrise from the top of the Bromo caldera. He inform me that they probably will get down from the mountain in the middle of the day and will take about 6 to 7 hour driving to Bali. If assume the road not too busy and there is no technical problem with any vehicle of the participant. But I quiet doubt about the time that taken from Bromo to Bali. My feeling says that they will delay the time arrival in Bali. On 23 December 2007 at 13.35 Bali time I call babe Harry asking their last position and get inform that they just down from the mountain and move to Bali. He predict that they will cross the Bali strait by 6.30 pm and will arrive in Palm Beach Hotel about 9.30 pm Bali time. So I call my friend who arrange the accommodation in Palm Beach Hotel to make sure that the rooms are secure and fit for the participants. Until 9.30 pm we still have no call or any information about the participant from Babe Harry. I call to his mobile, but he not picking up the handset. So I do my plan to going out to find some goods for my family needs. I went to Tiara Dewata super market until it’s closed about 9.45 pm. On 10.14 pm I call Babe Harry to check their last position. On the phone Babe Harry inform me that there is one vehicle now having a problem with the bearing of the front left wheel. The convoy stop in Probolinggo to fixing up and change the bearing. Babe Harry also ask me not to wait the convoy as he predict that they will delay to Bali about 5 hour. I count the hours to Bali and predict that the fast they will reach Bali by 5 am early in the morning. While waiting their arrival, I just lying on the sofa to wait the minutes coming by slowly, and finally I get slept without my knowing. I woke up at 7.30 am in the morning with surprise since last night I plan to wait and will meet the convoy in Ubung Station and will host them to Palm Beach Hotel in Kuta, but my plan is gone as I got sleep without knowing my self. I hand my mobile and dial Babe Harry mobile phone quickly. And a lady voice heard from the phone. She is Siska. Babe Harry’s secretary. “Good morning Dewa.” We just arrive and checked in to the hotel at 5.30 early in the morning. And almost all of the participant still slept since they are quiet tired after long journey from Probolinggo East Java without a rest as we must caught the schedule to Lake View Restaurant in Kintamani .” She explain to me without my request. “OK no problem. I just quiet worry about the participant if they got accident on the way.” I said. “Just let them to sleep for a few hour to recovery them self. Probably we will depart from Denpasar to Kintamani about 11.30 am Bali time.” I continued. “It is OK for you?” I asked her. “Oh it would be OK Dewa.” She replied. “I will cal you by 11.20 WITA Bali time to make sure that you and the participant will be alright.” I said over the phone. “OK” See you soon.” I replied and put my mobile phone on it’s case. The rain quiet hard falling. And I am quiet doubt whether we could see the panorama of Penelokan and Mount Batur caldera and it’s rock stone from the Lake View Restaurant due to the hard fog surrounding the space. I prepare my self to be ready at 10.00 Bali time. While my friend who wants to join us to go to Kintamani call me over the Radio Communication in dial 146.500 Mhz.asking me where is my last position. They are Ibu Dian with her husband and child beside Pak Dede with his daughter. They keep calling me over the radio. We ready to go. I and my wife Ditta and my daughter Dewinta ride my Trooper to Kuta. I call to Babe Harry mobile phone to check whether they are moving and make a deal the meeting point. “Yes Dewa.” He picking up the phone. “ Where are you now. ?’ He asking. “I am in Imambonjol street. Move to Kuta.” I replied.” “May we meet in the east of the Simpang Siur Statue?” I ask Babe Harry. “Oh OK. “ Said Babe Harry. “But we still awaiting some members that still not down yet from their rooms. Just wait for a few minutes.” He inform me. It’s alright. I will waiting in the east of the Simpang Siur Statue, in the left side of the street. “ I explain. The rain fall more hard and hard now. I see the digital clock in console box. The time display already been 11.35 WITA. All three of us feeling hungry since this morning we could not had our breakfast due to the time run so fast.. My daughter Dewinta keep calling me to find a good place to have a lunch. I drive my Black Trooper slowly and keep watching if there is a pub to have a lunch. “Stop dad.” There is a. pub for lunch.” Suddenly my daughter speak loudly and appointing her finger to one pub named “Warung Ibu Mega”. It is about 200 meters in the east of Simpang Siur. But we past the pub already for a few meter. I than swift the knob of the transmission to “R” and move back ward and directing my Black Trooper and park it in front of “Warung Ibu Mega” The rain still fall so hard. I open the lock of the door and ask my wife to go inside of the Warung Ibu Mega with my daughter Dewinta and I follows after they take a sit in front row table set. I ask my wife to make a quick order since we must take our lunch in a hurry to catch up the time. I take a medium plate of white rice one piece of fried chicken, a few of a jack fruit soup, a little of fried green bean and sambal. We order three glass of sweet hot tea . I ask my wife and my daughter to had our lunch quickly. So we had our lunch within 14 minutes. After pay our lunch for Rp.28.000,- for three we got on to the Trooper and I switch on the radio to call Babe Harry and the convoy from Brunei Darussalam. I call Babe Harry by mobile phone and asking do they move already. “Yes . We just move Dewa.” Now tell me the way to go to Simpang Siur.” He asking me again. “Can we talk over the radio communication ” I asked him. “Oh OK. It’s will be fine.” He replied. “We are using the frequency of KTI Jakarta. It is in 147.750 Mhz.” He explain me. “OK I will programming my radio and insert those frequency on it’s memory.” I replied and start to make a frequency. I look at my Icom IC2100 which mounted in the dashboard. I see the display monitor and start enter the number 147.750 Mhz and press the key of the MR to keep this frequency in the memory. After the frequency install in it’s memory of my Icom IC2100, I call Babe Harry thru the radio. “CQ CQ CQ. Babe Harry do you copy me..? Over…?! ?” I call Babe Harry thru the radio. “Coming Dewa.” I copy you.” “But please tell me the way to Simpang Siur.” He asking me about the way that they must to follow to my position. “Alright Be.” I replied over the radio. “ I will guide you to Simpang Siur now. From Palm Beach Hotel, you may go to the direction of By Pass Sanur.” I speak slowly on the radio. “Just out from the Palm Beach turn to the left from the palm Beach Hotel and follow the main road. On the “T” junction, you take to the right side to follow the straight way. After a few meter you will find another “T” junction. You take to the straight away as well. You will entering the Jl. Kediri street. You just follows this street till you find another “T” junction with a traffic light. In this “T” junction you should turn to the right.” I speak quiet loud since the rain even more hard now. The rain now falling down like crazy. It is really really hard rain. I drive my Black Trooper slowly due to the rain very hard and our vision only about 2 or 4 meter onwards. All are white and the washer glass could not cover to waive the water in the front glasses of my Trooper. It is very heavy to waive the rain water from the front windows of my Trooper. Even I switch to the high speed washer. I try to find the side of the street which is fit for some big vehicle with it’s big wheels. So I slow down my Trooper and stop when I see a quiet long space along the street, while I keep speaking over the radio with Babe Harry to guide them come to my position. “Dewa are you monitor…?” I heard Babe Harry call me over the radio. “Yes Be. Please go a head. Where is your position now. ?” I replied. “We just turn left on the “T” junction with traffic light in front of the Statue near the way to airport.” He said. “OK. You are in the right track.” I said. “You just passing the Statue of Brigjen I Gusti Ngurah Rai. The heroes from Carangsari residence who is died in Puputan Margarana battle during the independent war in the year of 1945.” I explain to him over the radio. “Now you just follow the main road, go a head do not turn any where.” I explain once again. “OK copy that.” He replied. “In the turn cross of the Statue of big Bima you turn right. This turn cross called Simpang Siur, because to many ways surround it which are will make the road user are confuse and make the traffic quiet confusing. Simpang Siur means confuse for every things. Perhaps.” I explain in detail. “OK. copy that.” He replied again. “We are already been in the turn and turn right now, but one ”kereta” still on the trap by the traffic light.” One participant sounding. “OK. Just slow down, I am only a few meters in front of you. Just see the Black Hi-Roof Trooper with car license no. DK999YQ with flashing the hazard.” I explain again. While waiting the convoy, I switch the memory of the radio to 145.000 Mhz, where my friend still awaiting me in Jl. Ida Bagus Mantra, High Way who will join us to convoy. Ibu Dian, Pak Made and Dede are still waiting us. I inform them to switch the frequency to 147.750 Mhz to join us. “Pak Made are you copy me..?” I call him over the radio. “Yes’ I copy you and stand by. Over.” He replied. “Pak Dede are you copy me here..? I call also Pak Dede to join. “OK. I copy. Stand by.” Over.” He replied. “Dewa are you monitor…?” Babe Harry call me on the radio. “Yes Be. Where are you now…?” I asked. No answer. But I see there is a light of the car in our back slow down their ways. I see more focus and I see Babe Harry jump out of the silver vehicle and walk to me under the rain. The vehicle seem so amazing. I try to see more detail and I know it is Toyota Hi Lux, Tiger. Seem so great and strong. I also soon jump out of the Trooper and come closed to Babe Harry. Who is wet by the rain. We shake hands and ask about our condition. “How are you Dewa…? Sorry we are not in schedule. We have some problem with the vehicle. Even my car left in Surabaya, due to the ball join are broken and must wait the parts from Kuala Lumpur now.” He explain to me. “OK Be. No problem. So now are we go direct to Kintamani to have a lunch or we will stop over in some places that interesting…?” I asked. “No. No. all of us are hungry now, because you know last night we check in to the hotel at 5.45 WITA early in the morning and no restaurants are open on that time. While this morning, we are get up very late to catch the breakfast time. So I think we will go directly to Lake View Restaurant for having lunch, and we will talking about the plan to go while we are lunch.” He said. “OK Be. Lets go. 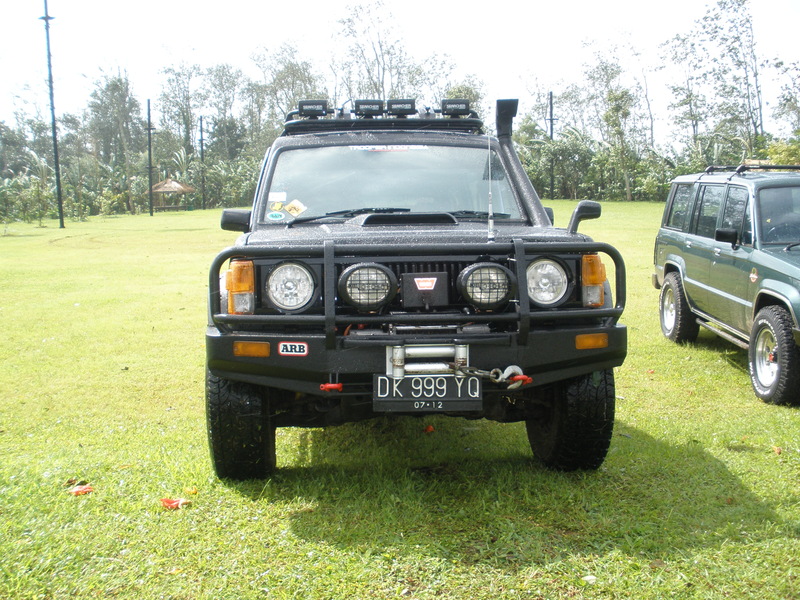 I bring my 4 X 4 friends who awaiting us in By Pass Professor Ida Bagus Mantra now. So lets go and I will be leader at the moment. Please follow me.” I said and we jump onto the vehicle and start to move to the east. “OK ladies and gentlemen, please follow the Black Trooper with license no triple 9. He is Dewa the Leader of Komunitas Trooper Indonesia, Bali. He will lead us to Kintamani. Lets move.” Babe Harry instruct to the participant and we move to the east. To Kintamani. The rain still continue even more hard than before. The time in my Trooper display at 11.44 am WITA or Bali time. While driving, I contact to Pak Made and Pak Dede and inform them that we are already on the move to By Pass Professor Ida Bagus Mantra where they are awaiting for us. I speed my Trooper up to 70 km per hour to catch up the lunch time. Driving in the rain time some time quiet comfortable as the cabin will be feel quiet nice cold and make us not felling tired quickly, but in the same time must take an extra careful since the road will be slippery and our vision is also limited due to the fog of the water close our vision. Like what we facing now, the road seem so white because of the fog and our journey to Kintamani still far away and will take about 2 hours driving. We keep contact each others over the radio to keep our convoy fit and in the proper line. We will had our lunch about 13.55 WITA. Quiet late actually. On 11.58 am WITA we finally get close with Pak Made, Bu Dian. 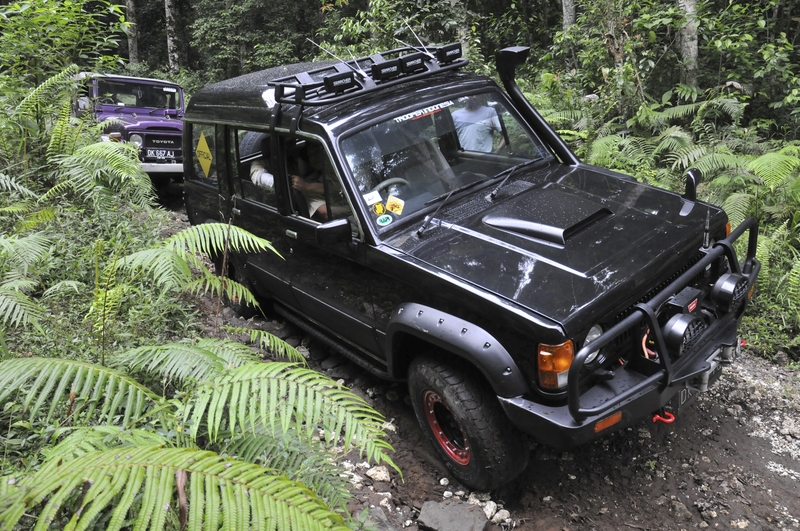 Pak Nyoman in their Grey Land Cruiser and Pak Dede with his Dark Grey FJ40 Hard Top. I call them and inform that we already been close to them and asked them to move an lead the convoy. “Pak Made Are you copy me…? I am in the back of you about 50 meters. Please move slowly and lead the convoy.” I asked them over the radio. “No, no, no. We just straight away to Lake View Restaurant in Kintamani to have a lunch as almost all of us are in a heavy hungry.” I explain to Pak Dede, while I drive the Trooper more fast as they start to speed their own vehicle faster. “OK than. Alright. We will speed for about 70 km per hour.” He replied. By 12.19 am WITA we passing in Sukawati art market and stag by slowly due to there is so many tourist foreign and domestic looking for souvenirs. There is a lot of big busses and private cars are parked a long the way of the street, which is make a traffic jam. “This is Sukawati art market where we can find a souvenir or a handicraft for your relatives or neighbor.” I explain to the participant over the radio. Please visit our site continuesly. I will post many journey report.